"I am my Beloved's and my Beloved is Mine" Wedding Band Ring from Song of Songs 6:3. Apples of Gold introduces the wedding band that truly encompasses the blessing of marriage with a beautiful yellow gold band that takes on the deepest romance. 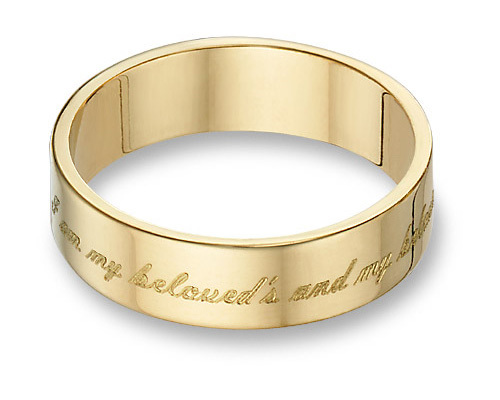 A very special engraving of a heartfelt verse from Song of Songs makes a plain 14K yellow gold band into an emblem of love. "I am my Beloved's and my Beloved is mine" from Song of Songs 6:3 offers the perfect way to remember your vows every day. The high quality 14K solid yellow gold ring also includes the comfort fit design so the band contours for optimal wearing ease. Comfort fit for optimal comfort when worn. Made in 14k solid yellow gold. Also available in 14k white gold or platinum (by request). We guarantee our "I Am My Beloved's and My Beloved Is Mine" Wedding Band, 14K Gold to be high quality, authentic jewelry, as described above.